It’s hard to find really good sushi in the Boston area. After watching the documentary, “Jiro Dreams of Sushi,” (a great film and a must see) I am even more skeptical about whether or not what we Americans eat as sushi is even considered sushi by quality standards. Nonetheless, I went to Fuji 1546 (not to be confused with another sushi restaurant called Fuji on the same street, which is much smaller, but possibly better overall). In all of Quincy, Braintree, and Milton there are only two passable sushi restaurants. Both of them are called Fuji. Fuji 1546 is on Hancock street, a little bit down the street from Quincy Center. The front entrance to the restaurant is misleading and kind of hard to miss if you’re not looking for it. Whenever I passed it before, I thought it was kind of a dump because the entrance is dark and you can’t really see inside the restaurant. When I finally went in once on a whim, I saw that the front entrance was just that, a basic entrance. Once you get inside, you can see that the restaurant is much much larger than you would imagine from the outside. There is a long bar on the left as you approach the dining area. The kitchen is in the back with an open half-wall so you can see the chefs. They also have what looks like a stage with speakers and a large projection screen (perhaps for karaoke). The lighting is a little on the dark side, but the restaurant looks kind of trendy although it might not remain that way for long after some wear and tear. Once seated, a server approached us pretty quickly for drink orders. Throughout the night or server was attentive and helpful with suggestions from the menu. This picture doesn’t do the size justice because the bowl was deep too, but my friend in the photo is a good reference. The miso soup was pretty standard. It came out warm, but not really hot and it tasted like a basic miso soup. Average taste overall, and no real negative quality. The star appetizer though was the seaweed salad. I’ve never seen a portion of seaweed salad that size before. 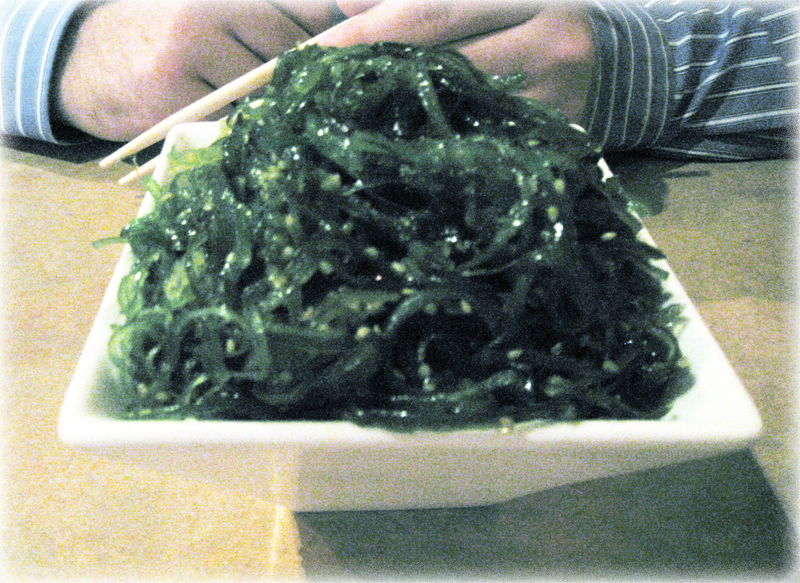 One seaweed salad at Fuji 1546 can definitely serve 2 – 3 people. The price is along the same lines as other standard seaweed salad prices, but you get a ton of it. Best of all, it was actually really good! The sesame flavor wasn’t too strong and the ocean flavor of the seaweed tasted fresh rather than fishy. I would definitely recommend this surprising portion of seaweed salad as an appetizer, but share with someone else, or you’ll be bringing some of it home. My friend and I wanted to order some sake, but like many people, we don’t know anything about sake. I usually get warm/hot sake, but since it was summer time, we opted for cold sake. We asked our server for a recommendation and she suggested an affordable bottle of sake that she brought in a decanter. 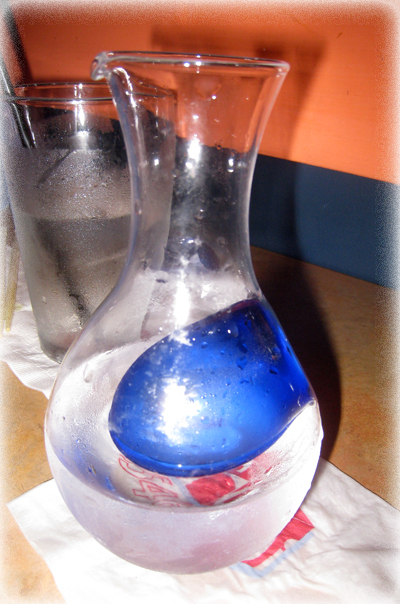 It had a hole in the middle for ice to keep the sake cold during the meal. While a really interesting novelty, it was a little problematic when the ice turned to water and would leak out if you poured the wrong way. The sake itself was nice, but again, I’m not a connoisseur, so that’s the best I can say. Maguro Nigiri – Two fresh pieces of tuna over rice. Not only was the display of these rolls fantastic, but they looked as good as they tasted. The rolls all had very unique and distinct flavors. 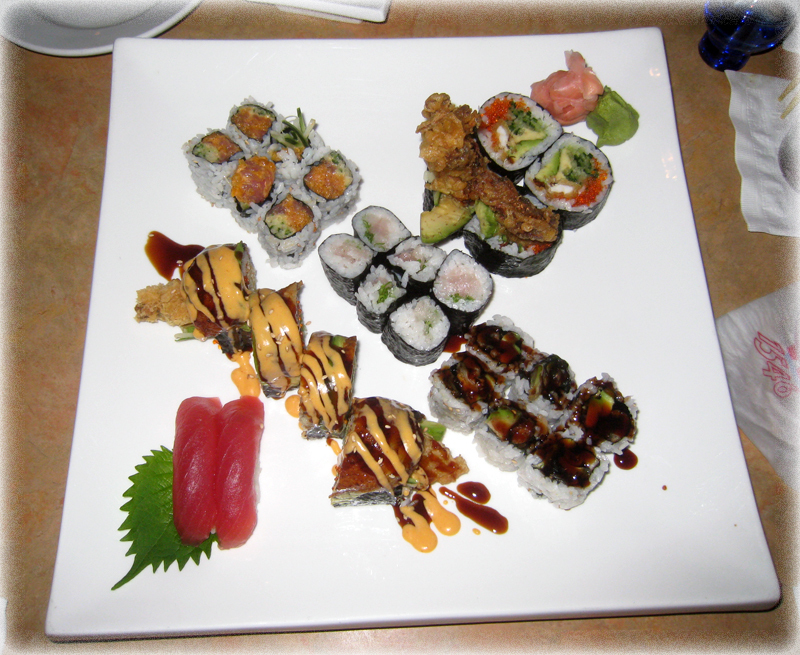 The best rolls from what we ordered were probably a tie between the Dragon Roll and the Spicy Tuna. Unfortunately, the only real drawback to this place is that sometimes they have a tendency to over-fry their seafood. While the shrimp tempura in the Dragon Roll was tasty, the soft shell crab was overcooked. A smaller concern is that their larger rolls are gigantic, which makes them hard to eat (definitely comedy fodder if you’re out on a date). I would suggest that they make a smaller, longer roll, so that you get the same amount, but in more manageable bites. Overall though, all of the sushi tasted fresh, was made to order, and left us satisfied. If you’re looking for a good place to grab some sushi south of Boston, I would definitely recommend Fuji 1546 as an option. It’s clean, affordable, and presents well on the inside. Rating: …one hand in my pocket and the other one is giving the peace sign.